Our lab technicians develop a finishing process that works best for your needs and narrow down the most effective, customized solution. If you're looking to address quality issues or improve your current process, Rodeco is your R&D partner. We believe that developing a cleaning or deburring process that is ideally suited for your business requires taking a consultative approach. This begins with an in-person visit to your facility to assess your manufacturing process and to determine your unique requirements. In addition, we will obtain your input regarding the objectives you hope to achieve as well as your expectations for the process results. We combine our in-house laboratory and testing processes to support and maintain our commitment to quality. 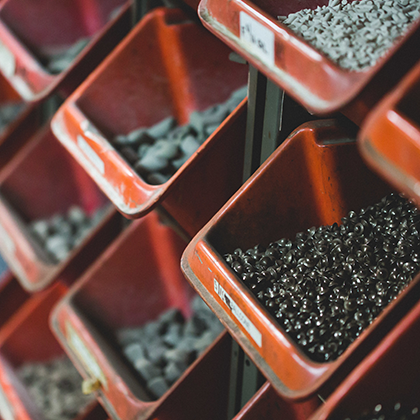 We use the latest equipment to ensure precision metal finishes while remaining compliant with industry specifications. As a result of our continuous and consistent testing methods, Rodeco is proud to be NADCAP Certified. You have a problem, Rodeco has the solution! Share with Rodeco what you want to improve and your desired results. From there, we begin to outline a plan together that can meet your goals. Connect with us on a conference call with our lab technician to confirm "everyone is on the same page" with regard to your specs and objectives. We typically request that you provide samples of the types of parts or materials that will require deburring or cleaning. We then test the parts to determine the appropriate machine and media that will produce the most favorable results. We will use the test results to develop a customized cleaning or deburring process that we will apply to your parts on a consistent basis to best meet your production needs. In fact, Rodeco's process development lab has averaged 150 tests per year for over 30 years. Once the testing has been completed, we will return the parts for your inspection. Taking your input into consideration, we will then make a recommendation regarding the best combination of media, compounds and machinery that will best meet your needs. As a result, you can be confident that the process you select will deliver results you expect– we've been ISO 9001 certified for 15 years. Our combination of knowledge, experience, and cutting-edge machinery and technology enables us to develop a highly effective deburring process for virtually any type of business, regardless of scope or size. The special challenges offered by high-volume or highly complex production operations are never an issue for Rodeco, as our team of lab technicians and production personnel are industry experts. We take great pride in our ability to provide cost-effective solutions to the most difficult deburring and cleaning issues. Every Rodeco employee is committed to one goal: achieving total satisfaction for every customer. We consistently score high in customer satisfaction year over year because of our commitment to your satisfaction. Our employees engage in continuous training to develop technical, problem-solving and leadership skills so we can better serve the ongoing needs of our customers. Rodeco Process Development: Vibratory Deburring Edition from Rodeco Company - Metal Finishing on Vimeo. YES, I WANT TO TALK TO THE JOB SHOPSend us this quick form. Shawn will followup. RODECO'S JOB SHOP GETS YOUR JOB DONE RIGHT & ON TIME. TALK TO RODECO'S JOB SHOP TODAY!Find out how we customize each job to make it right!